Milton Keynes, England, 6th August 2015: AVer, a leader and innovator in video conferencing and mobile solutions, has announced the launch of the VC520, a professional VC camera for efficient collaboration in conference rooms. 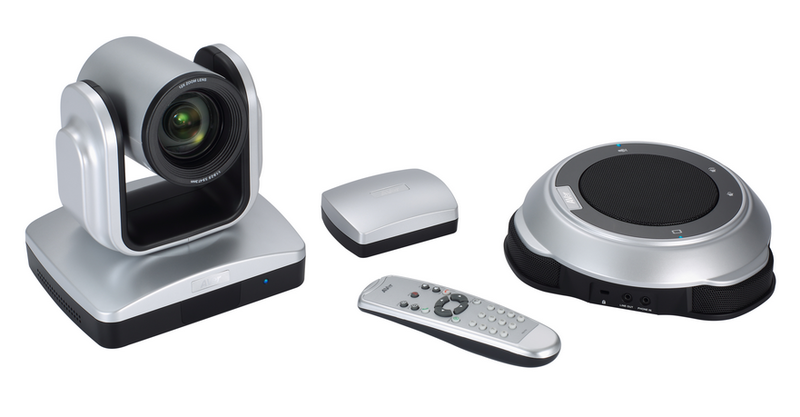 Designed for the modern office, and particularly suited to web or cloud-based conferencing, the VC520 addresses the need for professional yet affordable video conferencing hardware for any size of business. With a sleek, slimline design and simple plug and play operation it offers a portable solution that's well-suited to laptops, yet also has the power to effectively handle presentations and calls in rooms of all sizes. Featuring a powerful 12X Optical Zoom PTZ (Point, Tilt, Zoom) camera, the VC520 has the ability to provide detailed images of small objects or wide views of all participants. A fast, auto-focus lens works alongside ten camera presents allowing an operator, with a click of a remote, to move from person to person seamlessly and without interruption. Smooth pan, tilt and zoom brings life to whiteboard content and product demonstrations, and with Full HD 1080p output resolution users can enjoy lifelike, crystal-clear views even in poor lighting. Complementing the visual capabilities of the VC520 is a cutting-edge speakerphone that combines a 10W speaker with three embedded directional microphones for top-quality audio performance. It also offers industry-first daisy-chain functionality, ensuring that each participant's voice is clear and balanced, even in larger rooms. Designed with the demands of the modern office in mind, users can flexibly operate the VC520 alongside their chosen videoconferencing application, including WebEx, Google Hangouts, Skype, GoToMeeting, Skype for Business (Lync), and Zoom. Plug and play operation also makes setup and calling simple, bypassing the challenges of traditional solutions and putting high quality communication just a USB connection away. "The VC520 is the result of our desire to provide professional level VC solutions that are affordable for any business, but crucially that don't compromise on features and performance" said Bentley Lo, UK Country Manager, AVer Information Europe BV. "We believe that with the VC520 we have opened the door for more companies to embrace evolving workforce demands and communicate effectively both in a fixed location and on the move." AVer customers also benefit from an industry-leading three-year warranty. For further information on AVer's Visualiser, Video Conferencing and Surveillance products, please visit www.aver.com/uk. \"The VC520 is the result of our desire to provide professional level VC solutions that are affordable for any business, but crucially that don't compromise on features and performance\" said Bentley Lo, UK Country Manager, AVer Information Europe BV. \"We believe that with the VC520 we have opened the door for more companies to embrace evolving workforce demands and communicate effectively both in a fixed location and on the move.\"